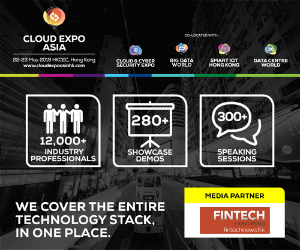 This year’s Hong Kong Fintech Week was all about cutting-edge technologies, enabling greater collaboration, and strengthening Hong Kong’s position on the global fintech scene. One of this year’s key topics was blockchain and cryptocurrencies. Participants and experts were unanimous on the tremendous potential that blockchain held to improve processes, efficiency, and help firms cut costs. But one subject that left regulators puzzled was the topic of initial coin offerings (ICOs), an unregulated means of raising funding that’s been growing in popularity in the startup community. “We’d welcome blockchain and fintech ICOs, but how do I tell the scammers from the real service companies?” asked James Lau, financial secretary of Hong Kong. Lau said Hong Kong will consider following Canada’s move in setting up a regulatory sandbox for ICOs. 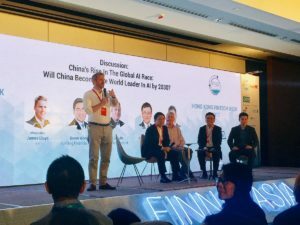 Artificial intelligence (AI) was also widely covered during the week long fintech event with keynotes from the likes of Ant Financial, Dianrong, and PwC, among others. In this field, mainland China has been a fast learner, building on advances in computer processing power, algorithms, and data collection used by academic researchers and major Internet companies like Baidu, Alibaba and Tencent to develop unique AI-powered fintech applications. 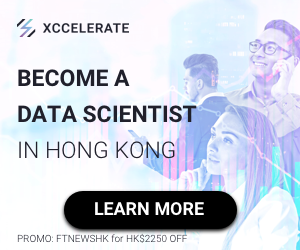 “The US has better scientists doing research in AI … [But regarding] the union of AI and financial technology, China is leading and will continue to dominate in the future,” Chan Ka-keung, adjunct professor of finance at the Hong Kong University of Science and Technology, said during a panel discussion. The rapid growth of fintech services such as peer-to-peer lending and online market funds was made possible by the lack of innovation by the country’s traditional banks. These are failing to address the needs of both the average consumer and small and medium-sized enterprises, Chan said. 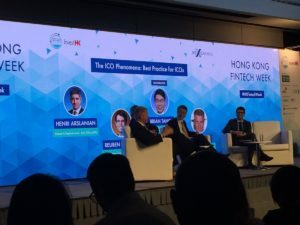 But most importantly, this year’s Hong Kong Fintech Week was the opportunity for the city’s government to demonstrate its commitment to advance financial innovation notably by unveiling a series of initiatives. 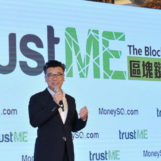 Hong Kong Monetary Authority (HKMA) chief executive Norman Chan took the stage on the third day of the event to announce agreements with Singapore and the city of Shenzhen to encourage further collaboration on fintech development. 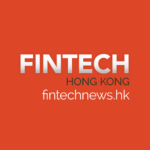 “It is crucial for Hong Kong to enhance collaboration with other fintech centers,” said Chan. On October 25, he signed a memorandum of understanding between the HKMA and the Monetary Authority of Singapore (MAS) to formalize the relationship between the two central banks. 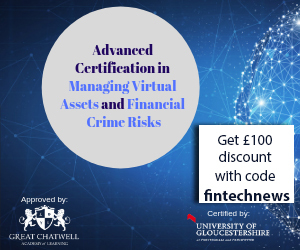 The first project covered by the scheme is to link trade finance platforms the two authorities are developing with blockchain technology to reduce potential fraud and errors. Besides joint innovation projects, the two monetary authorities said they will collaborate on other fintech initiatives, facilitate referrals of innovative businesses, share information, and exchange expertise to facilitate financial innovation in Singapore and Hong Kong. Another agreement, signed with the Office of Financial Development Service of Shenzhen (OFDS), seeks to support the development of fintech in the Guangdong-Hong Kong-Macau Bay Area as well as making it easier for Hong Kong fintech startups to operate in the southern Chinese metropolis, and vice versa. 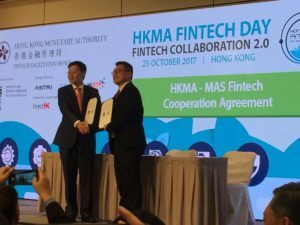 The HKMA and the OFDS will also jointly organize a fintech award offering total prizes of about HK$7 million that recognize and reward outstanding fintech products and solutions in Hong Kong and Shenzhen financial institutions. Image credit: Norman Chan of the HKMA opening the Fintech Day, Hong Kong Fintech Week 2017, @HongKongFintech, Twitter.